Once upon a time (8 or so months ago) I had this great idea that I was going to open up an Etsy shop...then I got pregnant and realized I had no time for something extra. I came to the conclusion I enjoy sharing and showing you how to make your own jewelry so much more than I would selling it. 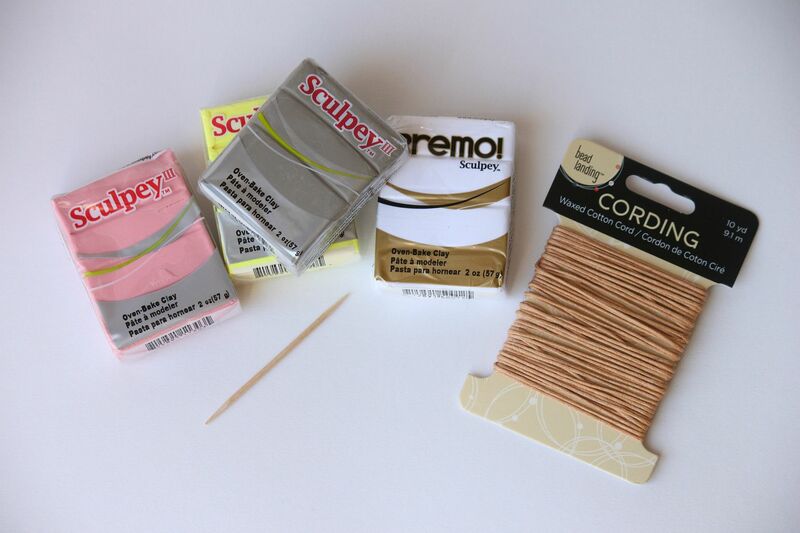 So here is to another fun and super easy polymer clay diy! This is s great project to start with if you are a beginner or polymer clay seems intimidating to you. You can not mess this one up. Polymer clay--you can use as many colors as you want. The color combinations are endless. Begin by conditioning your clay in between your hands until it is soft and pliable. 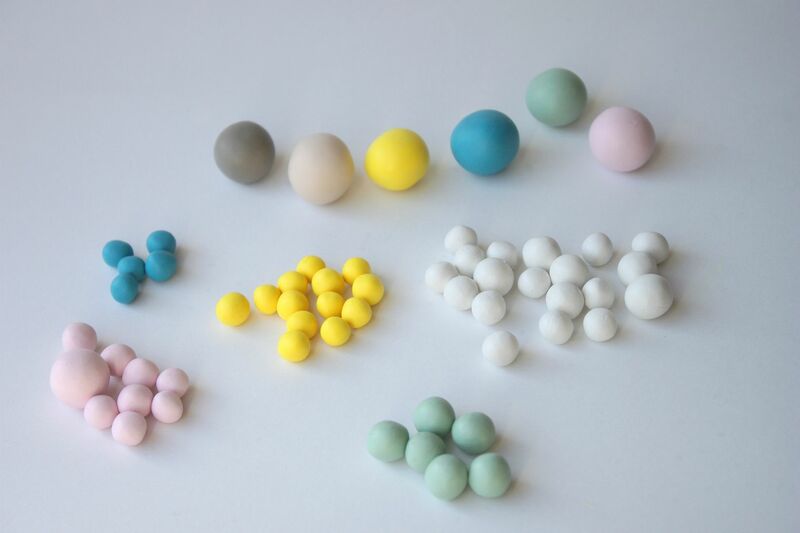 Roll out your clay beads by taking a small piece of clay and then making a little ball with the palm of your hand. You can make them as large or small as you like. 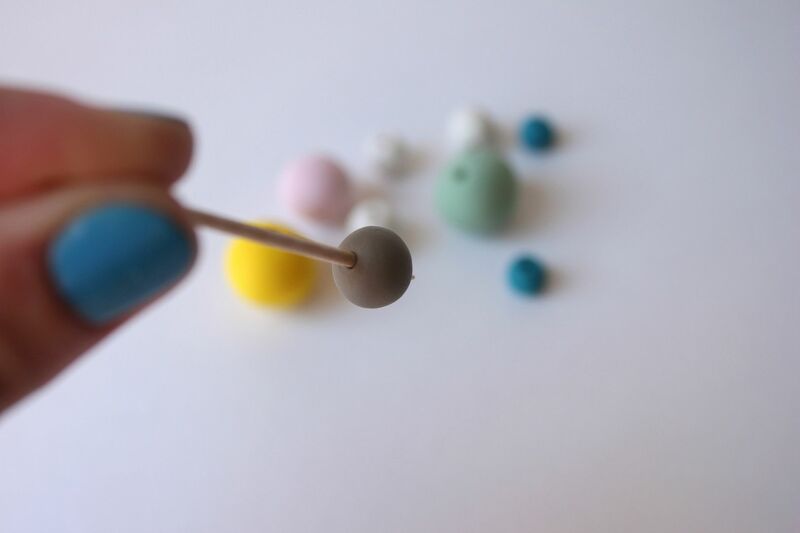 Use the toothpick to poke a hole in the center of each bead. If the clay you are using is really soft, you can wear latex gloves to help prevent fingerprints. Place your beads on a baking tray and bake according to clay directions. I baked mine at 270 degrees for 25 minutes. String your beads onto the cotton cord. This is where you can get creative. You can place all your beads on one stand or make a bunch of necklaces and layer them. Totally up to you! Attach some kind of closure on the back (I used a magnetic closure) and you are ready to go. If you want to make geometric looking polymer clay beads you can read this post. LOVE this so much and, you know what? I think I might just try it! I've been getting into jewelry design and this seems fun, easy, and cute! Love the colors :) Thanks for sharing!! I just wish I'd known about the latex gloves = no finger prints. When I made my necklace, I was struggling trying to not get finger prints on the clay. So cute. And perfect for spring! Might have to get the polymer clay out this weekend (unless baby comes!!). This is so neat! And I love those colors, this would be so cute for spring! Definitely going to need to try these! HOW CUTE and spring like! LOVE! I love the colors! Great project. You are so good at these polymer clay projects. This necklace is gorgeous! omgosh i really want to try this now! great diy girl! Aw, I LOVE this! You introduced me to polymer clay, and I have had so much fun creating with it! I have got to add this to my to-do list, thanks friend! I love your polymer clay posts! You rock! I plan to try some of your DIYs soon! So fun! This would be a great necklace to throw on with a spring outfit! I love it! My little sister is huge into arts and crafts. I am thinking this would be fun for us to do together while she is home! so cute!! and so creative! girl, i bet your hands were sore from rolling all of those circles (mine ached the day after making my bracelets!). But I love the springy colors!! wow! I know I would mess this up but yours looks so, so darling, you've got some serious crafting talent, good for you. I think this is by far my favorite clay project of yours! 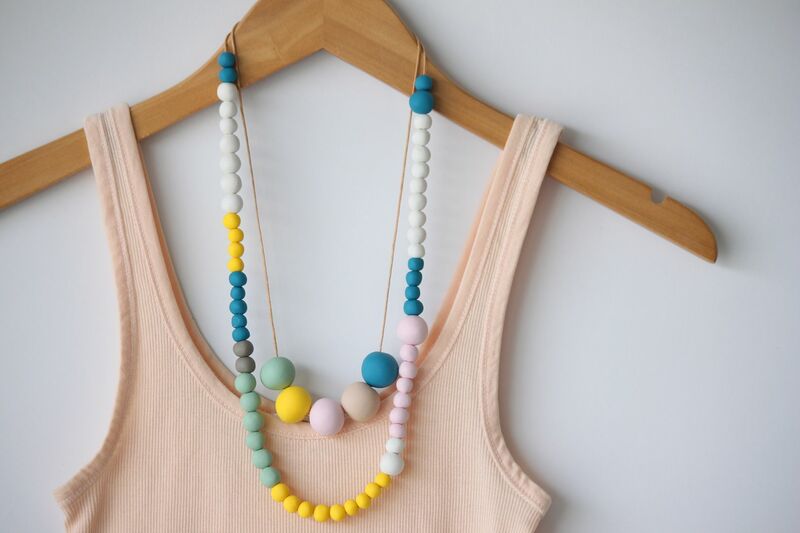 The necklaces are a great color combo and look like they just walked out of a catalog. holy crap! this is so awesome! OMG I LOVEEEE these!!! Please make me one. I'll pay you! Saw this on craftgawker, and before I saw your name, thought to myself "this has to be Lindsay!" You are the polymer clay QUEEN (I probably told you that before...but it's true!). LOVE your ideas. Ok- So excited to have run into your blog! Loving it- loving every little thing about it!! This necklace is adorable and so stylish yet very simple! Yep, I like! Off to explore your blog some more! Thanks for stopping by my way! I am a new follower!! I agree with Rebecca! You are the polymer clay queen!! this is so springing I can totally see this on you! very creative sis! Love love love! Thanks for sharing! this is so fun! love your colors. I've been playing around with polymer clay for a few months & am really enjoying it. I'm so excited to try the rest of your tutorials, and I fully credited you for this one! I love it!!! could you please tell me if you leave the toothpick while you are baking the clay beads? or are they baked all just with the hole and without the toothpick? thanks! you're a star! Thanks for the tutorial, it was very helpfull! Hello this is super duper idea. love your pattern, and your creativity. thank you for your tutorial. good idea. i am going to do this soon..
you can visit my blog too..
Hello Lindsay, your creativity is super. thank you for your tutorial. it is wonderful idea. Thanks for great tutorial, and very much to share us valuable information how to create jewelry.